I love linen — it’s breathable, light, and so classic! But my skin can also be sensitive to fabrics sometimes. 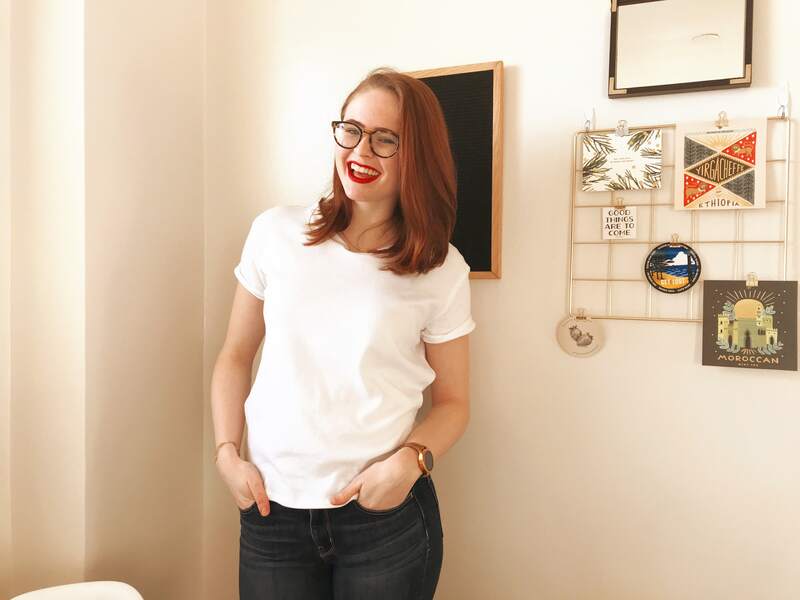 Even though I prewash it, linen often leaves me feeling a little itchy and uncomfortable until it’s softened up in the wash a few times. When I lived with my parents it was easy enough to throw linen in the wash a few times in a row. With five to six people in the house, including two teenage boys, there’s always laundry going! But now that I’m living alone (and in a building where I have to pay $1.75 per wash or dry), I can’t justify just throwing linen makes into the wash over and over. 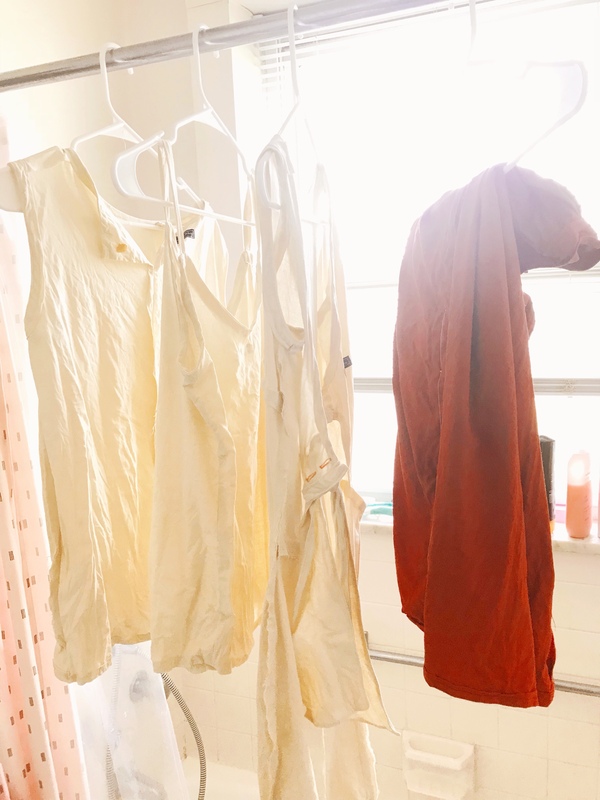 I needed another way to soften those garments, and today I’m sharing with you how I naturally soften linen! You need three things to naturally soften linen: water, a tub (plastic or bathing), and baking soda. Yep, that’s it! You can swap out the baking soda for vinegar, but I didn’t want to deal with the smell in my poorly ventilated bathroom. I used two plastic storage containers that I had in my closet, because my bathtub makes me nervous even though I bleach it every weekend. I put them into my bathtub and used my shower head to fill them up. Place your linen in your tub. You can do this to the full length you purchased or the finished garment. In one tub are my cream blouses and dress, and in the other is my red midi skirt: both made as part of my capsule wardrobe for Italy! Although the fabric was prewashed, I was a little concerned there might be some dye transfer from the red skirt. I’m glad I separated them, because when I pulled out the skirt the water left in the tub definitely had a tinge to it. The black and olive linen is a different weight and not as itchy, so I didn’t soften it. I dumped about a third of a cup of baking soda on top of each tub of garments. In retrospect, I probably should have added more baking soda to the cream tub, since there’s more stuff in it. But, that did not occur to me and I added the same amount to both tubs! Then, I filled them with water about six or eight inches deep. I just wanted to cover the fabric with a few inches of water, it doesn’t have to be a full tub. After that, I headed off to work and let them sit for about fourteen hours. After a good long soak, I pulled them out and wrung them out. Side note: talk about an arm workout! I hang dried them on my shower curtain pole overnight, and tested their softness the next morning. It worked pretty well! The red skirt is definitely softer than the blouses and dress, shockingly enough. But the cream pieces are still definitely wearable, and I think with a post-wearing wash should be perfect. I think adding more baking soda or soaking them a full 24 hours would achieve the same result. But ya girl ran out of baking soda and had to shower! I’m really happy that I found this hack to naturally soften linen. I love linen, but have been avoiding using it recently. I didn’t know how to get it softer without having to pay for tons of loads of (mostly empty) laundry. This baking soda hack is so easy, and saves me time, money, and the guilt of running a washer with three things in it. This is really handy! Would it work on any plant fiber, do you think, or just linen? I have some cotton lawn that’s a little too crispy for my liking. I bet it would work on plant fiber! I mean, baking soda certainly won’t hurt your fabric so it can’t hurt to try, right? I use a cleaner with bleach! Maybe it’s not technically bleaching it. But my apartment is very old and was fairly dirty when I moved in and I still can’t move past the idea that there might be something yucky lurking in there! Great idea Katie. I’m going to try it out! Thanks, Missy! Let me know how it goes! This was so helpful! I thrifted a linen dress I love but the stiffness makes almost unwearable. Hopefully softening it up will make it perfect! I hope this works for you, Kara! I noticed a real difference after just the baking powder, and now after another wash or two they’re like totally different garments. Not unless it’s horrendously wrinkled! Does this take a lot of colour out of black linen/any colour linen? Hi Shari, sorry about the delay, I’ve just seen this! No, I didn’t notice any color loss, but I had prewashed my fabric.